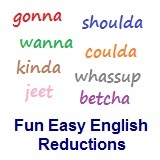 ﻿ Fun Easy English - new-american-english-reductions-reduced-words-topic-word-of-kinds-of-kindsa. In this lesson you will learn the American English reduction kindsa. What kindsa food do you usually eat at restaurants? What kinds of food do you usually eat at restaurants? What kindsa things did you do when you visited India? She likes all kindsa chocolate. He said all kindsa mean things. What kindsa sushi do you like? Eating all kindsa seaweed is good for you. This reduction is probably not used as often as some of the others but you will still notice it in conversations among native American speakers. Reductions, such as kindsa are not real words in English.